You store your most valuable and sensitive data in a database, but most vulnerability assessment products don’t know enough about database systems to thoroughly test them, putting your data at risk. Practically every week there’s yet another announcement of a major data breach. 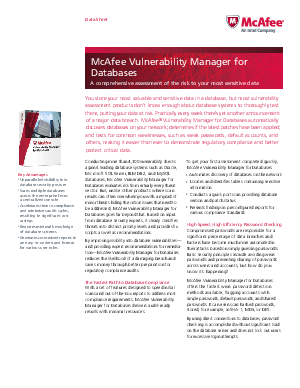 McAfee® Vulnerability Manager for Databases automaticallydiscovers databases on your network; determines if the latest patches have been applied; and tests for common weaknesses, such as weak passwords, default accounts, and others, making it easier than ever to demonstrate regulatory compliance and better protect critical data.